The Chamber staff through telephone inquiries, walk-ins, and Internet inquiries, makes referrals, whenever possible to chamber members only. Members can provide the Chamber with a business description which further aids us in making referrals. The Chamber encourages all members to patronize other members. The Chamber receives hundreds of phone calls, letters, e-mails, and visitors who inquire about products and services. Chamber members will be given the opportunity to advertise his or her business on cards or brochures that will be showcased on a rack in the Visitors Bureau. 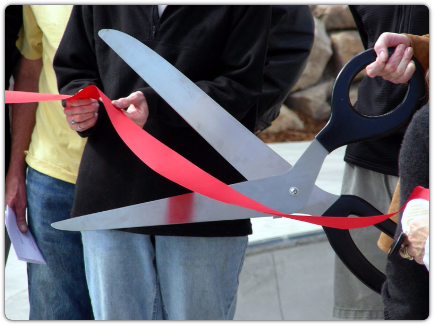 Members receive a ribbon cutting ceremony hosted by the Redcoat Ambassadors and publicized by the local media. These events include: grand openings, welcome to the Chamber, and special events. The Chamber strives to create a secure local economy to keep businesses moving forward. We promote a strong public image for businesses locally and statewide. The Chamber is involved in politics so you can focus on your goals. We relay the opinions of the members to elected officials and monitor legislative issues that impact the business community. This new feature allows Chamber members to create or enhance a web presence, optimize their business to look great on mobile devices, offer coupons and daily deals to customers, and present their business through photos or videos online. Go to http://www.commercecontrolpanel.com for more information on this great benefit for members! ​ Courthouse marquee and website are available to display meetings and special community events. The Chamber holds regularly scheduled "Mixers", hosted by Chamber members, which give members the opportunity to meet other Chamber members and potential clients or customers. The Mixers also give each member the opportunity to showcase their products or services, along with some great publicity in the local news media. Members can request a complimentary list of chamber members. One-on-one, personalized business planning sessions, with trained business counselors, offer guidance on marketing, finance, and creating business plans. As well as, providing support and education, workshops/seminars, and possible loan assistance.